Do you need a limo for your Leicester wedding or for business travel needs in Leicester? Crystal Chauffeurs is here to assist you. We are a premium Leicester limo hire company. We offer highly commendable Executive Limo Wedding Car Hire Leicester services that will meet all your transportation needs. You could hire our limos for all your needs and enjoy a highly satisfactory service. We are committed to offering our esteemed customers with very reliable services. We have a stunning range of limousines including but not limited to Baby Bentley Limo, Pink Limo, Hummer H2 Limo and Ferrari Limo. If your looking for limo hire in Leicester, look no further. If you are looking for a limousine for your business travel needs, we have our sleek Baby Bentley Limo. If you are looking for something special for your dream wedding, you could go for Millennium Limo that will make your wedding day celebration grand. We have something special for all your needs. We encourage you to take a look at our complete range of limos before you select your limo. We are a very professional yet flexible limo hire Leicester service provider. Our professional approach to offering limousine hire services makes the whole process very simple and easy. We have effectively handled hundreds of limo hire requirements and we will be able to provide you with top-notch services regardless of the complexity of your requirements. There is no limo hire Leicester requirement that we cannot meet. What makes our limo hire services special is that we pay attention to details and we put ourselves in our customers’ shoes. These enable us to understand your requirements better and help us serve you better. Our aim is not just to meet your expectations, we always strive hard to go beyond and exceed your expectations. 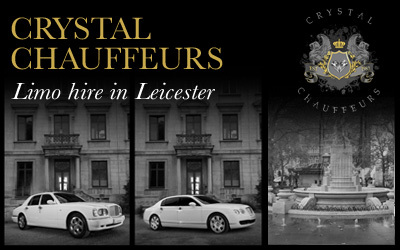 You will therefore find a highly reliable limo hire services and the best value for your money at Crystal Chauffeurs. We want every customer that approaches us with their limo hire requirements to enjoy their ride and be totally stress free when it comes to making a limo booking. We keep the whole process simple and easy. We save you all the hassles that you would otherwise normally face with other limo hire services. You do not have to make countless calls to book, confirm and to follow up your limo booking. No last minute changes or let downs. You are safe when you approach us with your luxury transportation needs. Experienced and fully licensed chauffeurs will accompany our limos to serve you and to make you feel special. We are always punctual and you need not have to worry about last minute anxious waits. Our chauffeurs know routes with less traffic and shortcuts that will help you reach your destination fast. Our well-furnished interiors will provide you with a cosy and comfortable drive that is enjoyable and memorable. We offer our Executive Limo Wedding Car Hire Leicester services at very impressive rates. We will provide you with a customised quote and you just need to pay for your needs and not have to worry about rigid packages. Contact us today for your no obligation free quote.